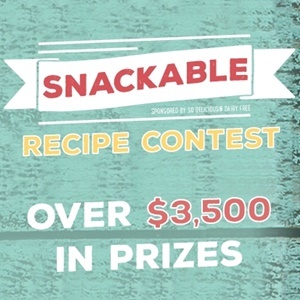 To celebrate the release of the FREE Snackable eBook, the good folks at Go Dairy Free and So Delicious Dairy Free have teamed up again to sponsor the ultimate Snackable Recipe Contest! Contestants may enter two recipes in the Savory, Sweet, or Sippable categories and this is my second and final Savory entry. 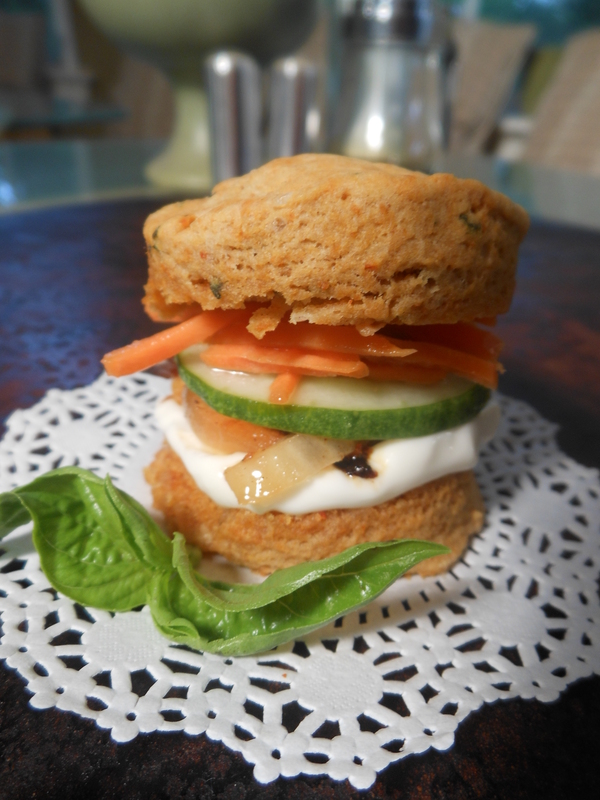 I have to say, myy Vegan Bangkok Biscuit Stacks are every bit as irresistible as I thought they might be when the idea popped into my head yesterday (after an unmitigated disaster of an attempt with another idea the day before!). Quick recipe note: avoid omitting the teaspoon of vinegar or vegan fish sauce as it is necessary to interact with the baking soda for proper rise…and, boy do they rise! 1/3 cup caramelized onions or 8-2 inch grilled tofu squares, etc. Preheat oven to 45o degrees. Melt 1 tablespoon vegan butter in a 6-inch (or larger) cast iron skillet placed in oven. Remove and set aside. In bowl of food processor, place flour, baking soda, salt, remaining 2 tablespoons of vegan butter and shortening. Pulse a few times until vegan butter and shortening are well-distributed throughout and dough looks like damp sand. Add curry paste, vinegar or fish sauce, and basil leaves and pulse until basil is finely chopped. Drizzle with coconut creamer and pulse until dough comes together in a ball and basil is minced, but still visible. Note: you may cut the butter and shortening into flour mixture by hand, mince the basil, and mix all ingredients together with a fork if you prefer. Turn dough onto a lightly floured surface and pat into a 3/4 inch disk. Working quickly, fold in sides like you are folding a business envelope, pat into a 3/4 inch disk, turn a quarter turn and repeat 4 more times. Cut with a 2 inch biscuit or cookie cutter or sturdy glass. Place each biscuit into the prepared skillet, right side down, and then flip right side up to coat both sides with butter. Bake for 10 to 12 minutes. Remove from oven and, when cool enough to handle, spread each biscuit with 1/8th of the Garlic Aioli, 1/8th of the caramelized onions or a slice of tofu, and 1/8th of the Pickled Veggies. Serve immediately, garnished with fresh basil sprigs. Toss together in a small non-reactive bowl or carton and set aside. In a small cup, whisk together mayonnaise and garlic powder until well combined.